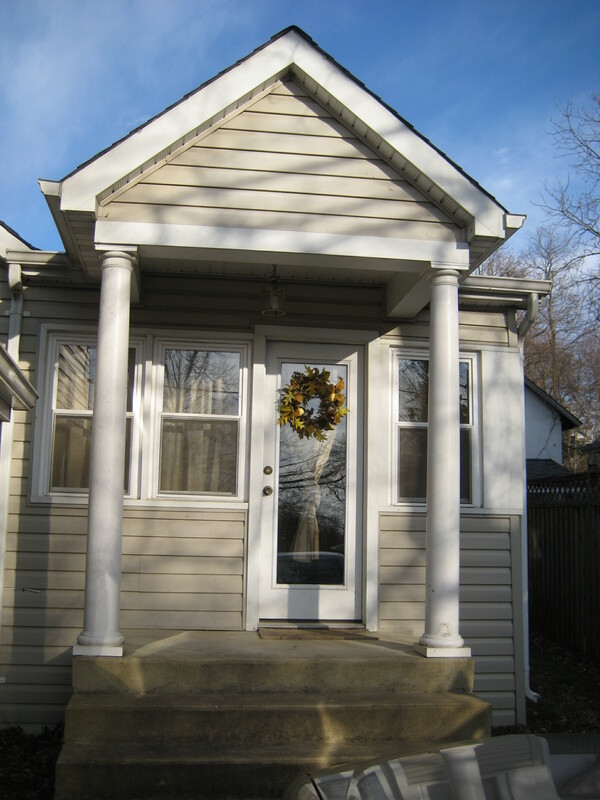 I am now the proud renter of a one bedroom, one bath cottage only a few blocks from Old Town Warrenton. The town is the county seat, and it’s the cutest darned thing I’ve ever seen. I can’t wait to continue exploring, and I’m very happy to find myself so close to so many local shops and restaurants. The housing hunt was thankfully short and easy. Before I drove to Virginia, I set up several appointments for my first full day in the area. I arranged to see The Cottage and two apartments, each in a different town, but all relatively close to the town in which I’ll be working. The other two apartments were both nice in different ways, but after considering the pros and cons to each, I decided I liked The Cottage enough to rent it without seeing any more places. So far, I’m happy with my decision, but there are certainly moments when I wonder what I’m doing. I want to share a little bit about The Cottage and some before and so far photos. I decided not to call them “after” photos because I don’t feel done yet. I have a list of things I’m looking to buy, but I’ll note in the photos what I want to do. For the full gallery, scroll down to the bottom! I took way more pictures than fit in this post! When you walk into The Cottage, you immediately enter a front sun room. Two walls are completely covered in windows. When I moved in, there was a desk to one side and not much else. 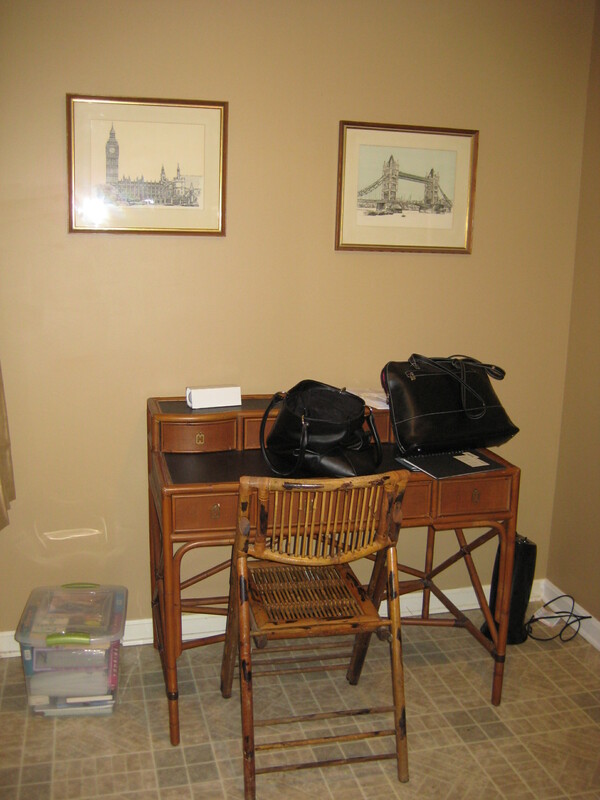 I stuck the only piece of furniture I brought with me, a side table, in that room. So Far: Sun Room... I hung up my art from China and moved the table out here so I can drink my coffee with the morning sunshine. London art were there when I moved in, but I’m thinking of taking them down and replacing them with something my personal to me. 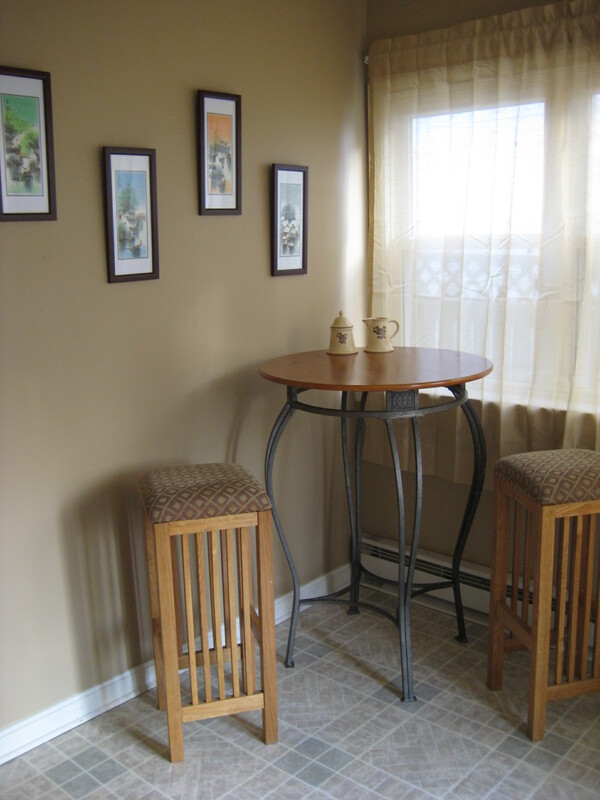 The chair now in the corner is also not 100 percent steady, so I want to replace it with another chair of similar size that can double as a desk chair and extra seating for guests as well as a place to put on and take off shoes. Before: Kitchen... still pretty disgustingly dirty, but soon to be nice and tidy! Beyond the sun room is the kitchen. The table used to occupy a lot of the walking space, and I’m much happier not running into it every time I walk through. Eventually, I want to add more art to the wall above the side table and maybe move it elsewhere and replace it with a funky, bright colored shelf. So Far: Kitchen... I want a clock and maybe a few more things to hang on this wall. This side table was the only pice of furniture I brought with me. 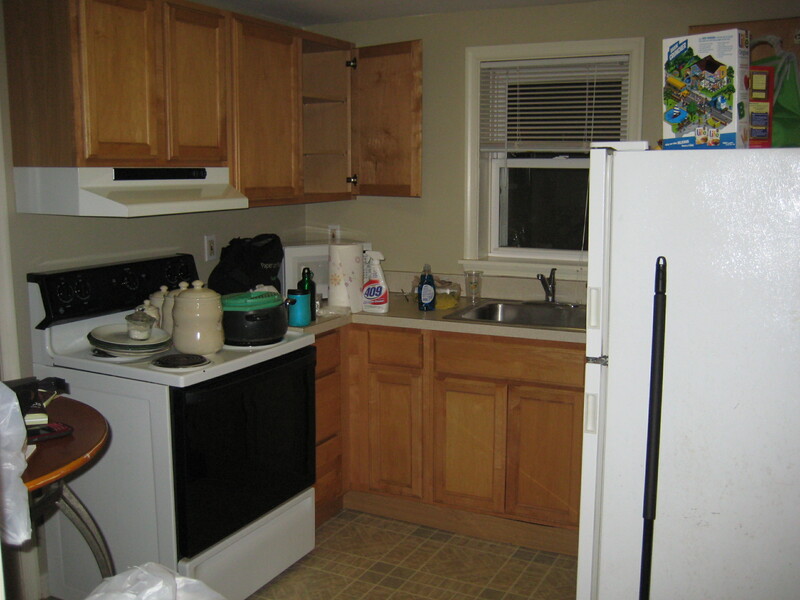 Obviously the kitchen didn’t take too much arranging, but there was a lot of cleaning needed. I quickly learned that my landlady was more concerned with everything looking clean than actually being clean. The oven was the last thing to get clean and probably the worst of everything in the whole house. Oh my goodness. This ended up as a dumping ground for anything and everything that didn’t have a home. I basically left the couch where it was when I moved in, but I moved the TV stand around and repurposed it as a bookshelf. It doesn’t quite hold all of my books, so I want to replace it with a bigger shelf soon. Until then, I’m trying to artfully pile books and photo albums in various places. I also moved the desk in here since I’m not going to buy a TV, and already I love having a spot to organize paperwork and set my purse. 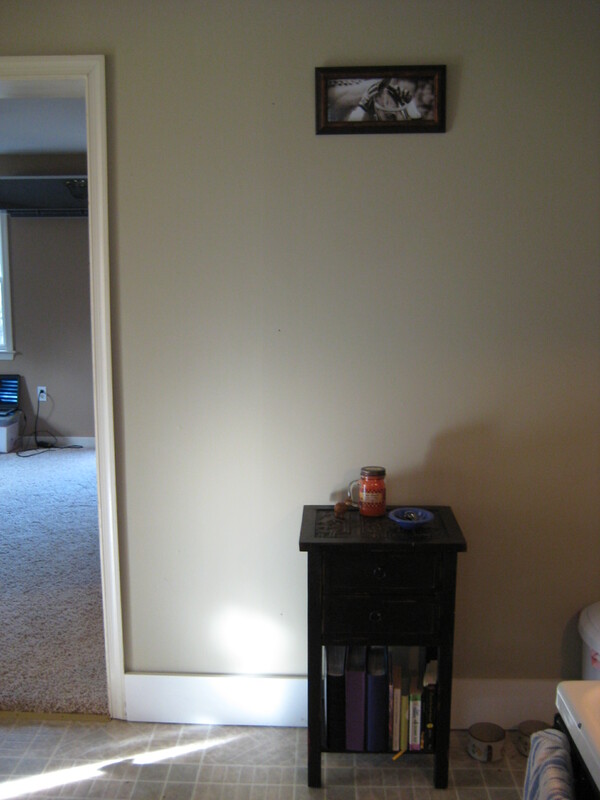 I plan to add some photos to the wall above the desk to create a bit collage of photos and art. For right now, it’s just the two paintings from Amarillo. I also am in search of curtains, but I haven’t decided what I want yet. At this very moment, I’m thinking a bright blue. 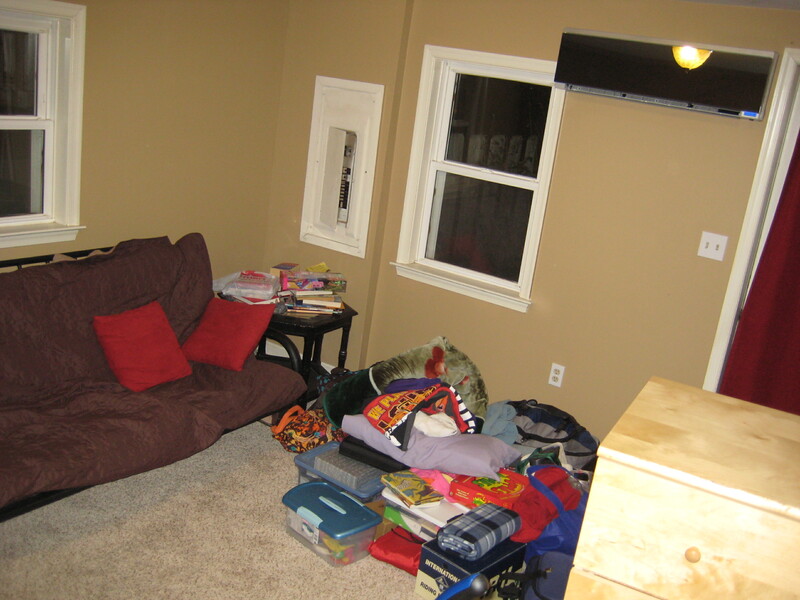 Before: Living Room... All of that stuff fit into the trunk of my car. 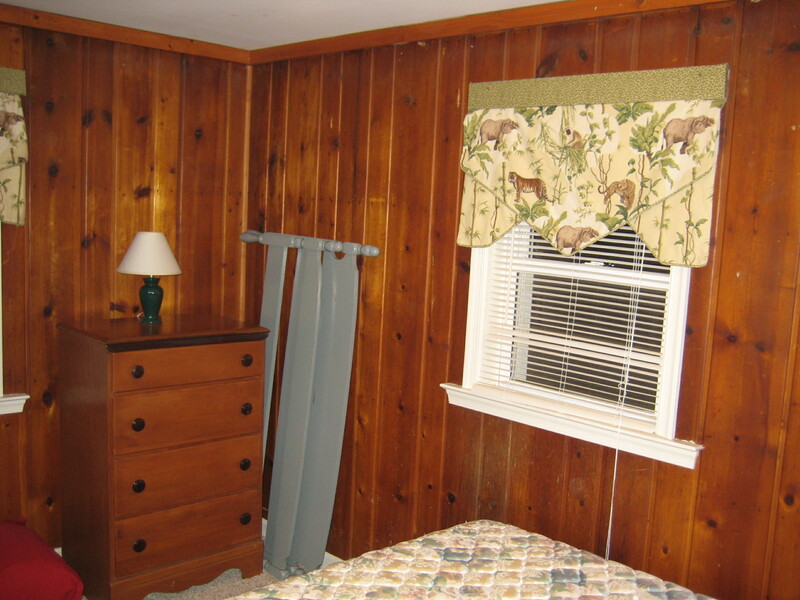 Before: Bedroom... the curtains are just gorgeous, and I love the random extra bed frame! The jungle curtains came down, thank goodness. The bedroom is actually the place with the fewest changes. I want to find some frames to hang on the wall with photographs, but I didn’t like anything I had in there. I did hang my horseshoes, and the closet is filled with my clothes. I’m also going to keep an eye out for a comforter that will make it feel more put together instead of thrown together. 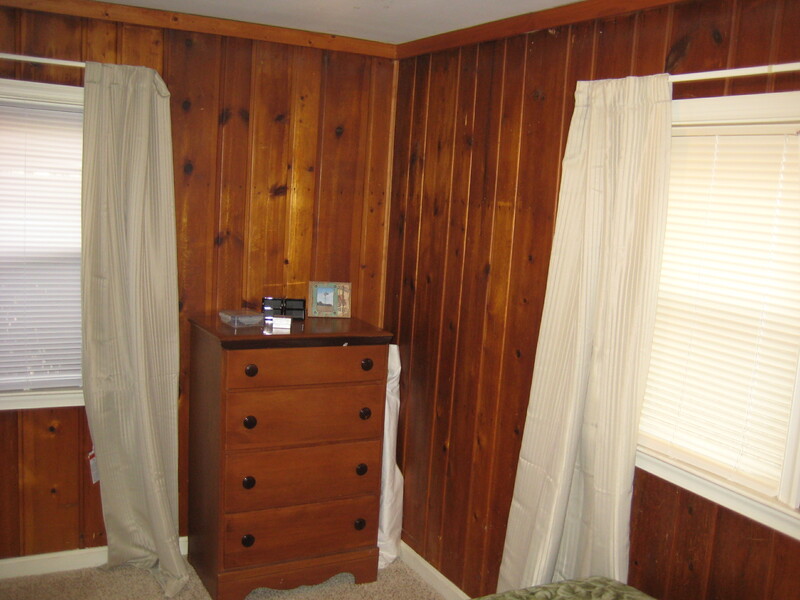 The wood paneling is still gorgeous (argh), but at least the curtains are gone! So Far: Bedroom... I replaced the curtains, but I need to find something light and bright to put on the walls. And that’s it! That’s the whole house! COMING TO VISIT. I don’t know when, I don’t know how, but I have a friend on the East Coast…kind of a given that a visit is overdue! lol looks great so far Megan dear! Yay! You are welcome any time! I love your little cottage! It’s so very cute!